Coloborhynchus piscator, a Late Cretaceous pterosaur. Pterosaurs (from the Greek "πτερόσαυρος," meaning winged lizards), often referred to as pterodactyls (from the Greek "πτεροδάκτυλος," meaning "winged finger"), were flying reptiles of the taxonomic group Pterosauria. They existed from the late Triassic to the end of the Cretaceous period (228 to 65 million years ago). Earlier species had long, fully-toothed jaws and long tails, while later forms had a highly reduced tail and some lacked teeth. Pterosaurs were the earliest vertebrates known to be capable of flight. Their wings were formed by a sophisticated membrane of skin stretching from the thorax to a dramatically lengthened fourth finger. Although popularly misunderstood as being a type of dinosaur, pterosaurs, like the extinct aquatic reptiles ichthyosaurs and plesiosaurs, are not dinosaurs. Like the dinosaurs, however, pterosaurs have captured the public imagination and become iconic in popular culture. Pterosaurs (generally referenced by the generic term "pterodactyls") appear in a wide variety of fictional and non-fictional works. The pterosaurs went extinct at the end of the Cretaceous period, around 65.5 million years ago, during the mass extinction known as the Cretaceous-Tertiary extinction event (K-T extinction event). Approximately 50% of all plant and animal families disappeared at this time, including the non-avian dinosaurs. When the pterosaurs disappeared, their role as the dominate vertebrates in the skies was taken by the birds, which are considered to be of dinosaur ancestry. Fossilized pterosaurs have been found in North America, South America, the United Kingdom, Europe, Africa, and Australia. The first pterosaur fossil was found by an Italian naturalist, Cosimo Collini, in 1784. The name "Ptero-dactyle" was first coined by Georges Cuvier in 1809 for a specimen recovered in Germany; however, due to the standardization of scientific names, the official name for this species became Pterodactylus. Nonetheless, the name "pterodactyl" continued to be popularly applied to all members of this first specimen's order. A famous United Kingdom find was an example of Dimorphodon by Mary Anning, at Lyme Regis in 1828. At least 60 genera of pterosaurs have been found, ranging from the size of a small bird to wingspans in excess of 10 meters (33 feet). Since the first pterosaur fossil was discovered in the late Jurassic Solnhofen limestone in 1784, twenty-nine kinds of pterosaurs have been found in those deposits alone. Most paleontologists now believe that pterosaurs were adapted for active flight, not just gliding as was earlier believed. Most pterosaur fossils did not preserve well. Their bones were hollow and, when sediments piled on top of them, the bones were flattened. The best preserved fossils have come from the Araripe Plateau, Brazil. For some reason, when the bones were deposited, the sediments encapsulated the bones, rather than crushing them. This created three-dimensional fossils for paleontologists to study. The first find in the Araripe Plateau was made in 1974. The three dimensionally preserved skull of Anhanguera santanae, from the Santana Formation, Brazil. Pterosaurs were highly modified from their reptilian ancestors for the demands of flight. Pteranodon skeletal drawing from a 1914 scientific paper. Pterosaur wings were formed by membranes of skin and other tissues, strengthened by various types of closely spaced fibers. The membranes attached to the extremely long fourth finger of each arm and extending along the sides of the body. A unique bone, called the pteroid, connected to the wrist and helped to support a membrane (the propatagium) between the wrist and shoulder. The pteroid might have been able to swing forward to extend this membrane, although this is controversial. In later pterosaurs, the backbone over the shoulders fused into a structure known as a notarium, which served to stiffen the torso during flight, and provide a stable support for the scapula (shoulder blade). There has been considerable argument among paleontologists about whether the wings attached to the hindlimbs as well. Fossils of the rhamphorhynchoid Sordes, the anurognathid Jeholopterus, and a pterodactyloid from the Santana Formation demonstrate that the wing membrane did attach to the hindlimbs, at least in some species. However, modern bats and flying squirrels show considerable variation in the extent of their wing membranes and it is possible that, like these groups, different species of pterosaur had different wing designs. Pterosaur's hip sockets were oriented facing slightly upwards, and the head of the femur (thigh bone) was only moderately inward facing, suggesting that pterosaurs had a semi-erect stance. It would have been possible to lift the thigh into a horizontal position during flight. Pterosaur bones were hollow and air filled, like the bones of birds. Unlike typical reptiles, pterosaurs had a keeled breastbone that was developed for the attachment of flight muscles and a brain that was more developed than comparable dinosaurs of similar sizes. Many, if not all, pterosaurs also had webbed feet, and although these have been considered to be evidence of swimming, webbed feet are also seen in some gliding animals such as colugos (the "flying lemurs"), and may have had an aerodynamic function. There is no fossil evidence of feathers, but pterosaurs were unique among reptiles in that at least some of them were covered with hair. Pterosaur "hair" is not true hair as seen in mammals, but a unique structure with a similar appearance. Although in some cases fibers in the wing membrane have been mistaken for hair, some fossils, such as those of Sordes pilosus (the "hairy demon"), do show the unmistakable imprints of hair on the head and body, not unlike modern-day bats. The presence of hair (and the demands of flight) imply that pterosaurs were endothermic (warm-blooded). Pterodactylus kochi appears to be well adapted to walking on all fours. There has been considerable debate about whether pterosaurs moved about on the ground as quadrupeds (utilizing all four extremities) or as bipeds (on two legs, like birds). A large number of pterosaur trackways are now known, with a distinctive four-toed hind foot and three-toed front foot; these are the unmistakable prints of pterosaurs walking on all fours. It has been suggested that smaller pterosaurs with longer hind limbs, such as Dimorphodon, might have walked or even run bipedally, in addition to flying, not unlike modern road runners. Other small pterosaurs such as Rhamphorhynchus may have scurried around on all fours. Larger pterosaurs with proportionately smaller hind limbs and massive fore bodies are generally thought to have moved about on all fours while on the ground. A pterosaur egg has been found in the quarries of Liaoning, the same place that yielded the famous "feathered" dinosaurs. The egg was squashed flat with no signs of cracking, so seemingly the eggs had leathery shells. The wing membranes were unusually well developed for a hatchling in an egg, suggesting pterosaurs were ready to fly soon after birth, though whether a parent took care of them is unknown. Very young animals have been found in the Solnhofen limestone beds, with the assumption that they flew to the middle of a lagoon, fell in, and drowned. A study of pterosaur brains using X-rays has revealed extraordinary information about their habits. Studying fossil pterosaur skulls is extremely difficult because they are so delicate, but scientists have used X-ray CT scans to build up three-dimensional images of the brains of two species. One striking finding was that the animals (Rhamphorhynchus muensteri and Anhanguera santanae) had massive flocculi. The flocculus is a brain region that integrates signals from joints, muscles, skin, and the balance organs. The pterosaurs' flocculi occupied 7.5 % of the animals' total brain mass, more than in any other vertebrate. Birds have unusually large flocculi compared with other animals, but these only occupy between 1 and 2 % of total brain mass. The flocculus sends out neural signals that produce small, automatic movements in the eye muscles. These keep the image on an animal's retina steady. Pterosaurs probably had such a large flocculus because of their large wing size. This extra area meant that there was a great deal more sensory information to process. Pterosaurs are known to have been attacked by spinosaurs, a type of theropod dinosaur (Buffetaut et al. 2004). Scientists found an early Cretaceous pterosaur fossil with a tooth of a spinosaurid embedded in it. The vertebrae are known not to have been eaten and exposed to digestion, as the joints were still articulated. Immediate predecessors of the pterosaur ("missing links") have not been found. Furthermore, the origin of flight presupposes that the anatomy of pterosaurs is considerably modified from any non-flying antecedents. Thus, the ancestry of pterosaurs is not well understood. They are generally, but not universally, thought to be related to the Dinosauria (dinosaurs) on the basis of their ankle structure. Pterosaurs demonstrate no adaptations useful for tree living, such as seen with birds. Thus, speculations on the development of flight focus on hypotheses other than the "tree-down" route. Most scenarios have pterosaurs evolving from long-legged, ground-running ancestors like Scleromochlus or Sharovipteryx, both of which had webs of skin from long hind legs to their bodies or tails. This would be a "ground-up" evolution of flight or even a route that involved gliding from cliff-tops. At the end of the Cretaceous period, the mass (Cretaceous-Tertiary extinction event) that wiped out all dinosaurs, and many other animals, seemed to also take out the pterosaurs. This extinction occurred about 65.5 million years ago. It is believed by some that competition with early bird species may have resulted in the extinction of many of the pterosaurs. By the end of the Cretaceous, only species of large pterosaurs survived. The smaller species were extinct, and seemingly replaced by birds. A lack of small pterosaurs in the fossil record could be explained by competition with birds or poor preservation due to the fragility of their skeletons. During the K-T extinction event, birds were the sole survivors among Dinosauria, though they also suffered heavy losses. 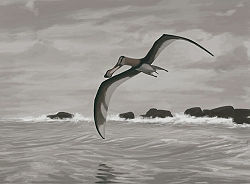 Others suggest that most pterosaurs were specialized for an ocean-going lifestyle. Consequently, when the K-T mass-extinction severely affected marine life that most pterosaurs fed on, they went extinct. The great sea reptiles of the Cretaceous, the mosasaurs and plesiosaurs, also fell victim to extinction. Pterosaurs are sometimes referred to in the popular media as dinosaurs, but this is incorrect. The term "dinosaur" is more correctly restricted to a certain group of terrestrial reptiles with a unique upright stance (superorder Dinosauria), and therefore excludes the pterosaurs, as well as the various groups of extinct aquatic reptiles, such as ichthyosaurs, plesiosaurs, and mosasaurs. Rhamphorhynchoidea (Plieninger, 1901): A group of early, basal ("primitive") pterosaurs, many of which had long tails and short wing metacarpals. They were small. They appeared in the late Triassic period, and lasted until the late Jurassic. Rhamphorhynchoidea is a paraphyletic group, so with the increasing use of cladistics it has fallen out of favor. Pterodactyloidea (Plieninger, 1901): The more derived ("advanced") pterosaurs, with short tails and long wing metacarpals. They appeared in the middle Jurassic period, and lasted until the Cretaceous-Tertiary extinction event wiped them out at the end of the Cretaceous. Dsungaripterus had a wingspan of 3 meters (10 feet), an unusual bony crest running along its snout, and long, narrow, curved jaws with a pointed tip. It lived during the early Cretaceous period. Pteranodon was 1.8 meters (six feet) long, with a wingspan of 7.5 m (25 feet), and lived during the late Cretaceous period. Pterodactylus had a wingspan of 50 to 75 centimeters (20 to 30 inches), and lived during the late Jurassic on lake shores. Pterodaustro was a Cretaceous pterosaur from South America with a wingspan around 1.33 meters and with over 500 tall, narrow teeth, which were presumably used in filter-feeding, much like modern flamingos. Also like flamingos, this pterosaur's diet may have resulted in the animal having a pink hue. It was South America's first pterosaur find. Quetzalcoatlus had a wingspan of 12 meters (40 feet) but weighed only 50 kilograms (110 pounds), and lived during the late Cretaceous period. Rhamphorhynchus was a Jurassic pterosaur with a vane at the end of its tail, which may have acted to stabilise the tail in flight. It was reported by an article in The Illustrated London News (February 9, 1856, page 166) that, in 1856, workmen laboring in a tunnel for a railway line, between Saint-Dizier and Nancy, in France, were cutting through Jurassic limestone when a large creature stumbled out from inside it. It fluttered its wings, made a croaking noise and dropped dead. According to the workers, the creature had a 10 foot wingspan, four legs joined by a membrane, black leathery skin, talons for feet, and a toothed mouth. A local student of paleontology identified the animal as a pterodactyl. The report said the animal turn to dust, as soon as it had died. This incredible story is believed to have been a hoax, stimulated in part by contemporary Franco-Prussian palaeontological rivalry. The Solnhofen limestone from Bavaria (in which Archaeopteryx would later be discovered) was producing many prized fossils, each of which was proudly announced by German paleontologists. The tunnel in question was through limestone of similar age to the Solnhofen Limestone, so it presented an opportunity for a shocking story by the French. Bramwell, C., and G. R. Whitfield. 1974. Biomechanics of Pteranodon. Philosophical Transactions of the Royal Society B267: 503-81. Buffetaut, E., D. Martill, and F. Escuillie. 2004. Pterosaurs as part of a spinosaur diet. Nature 429:33. This page was last modified on 12 June 2015, at 16:11.